As the convention season starts, our sponsor Alternating Reality books will be at Sakuracon and will make table space available for Comics Forge. We need an awesome anime writer as well, so if you think you got what it takes to be an awesome anime reviewer, check out our entry for “looking for a comics book reviewer” and see if you want to review stuff for us. Alternating Reality Books will be in booths 703 and 705 this year right near the convention control booth and the ATM, which is an awesome place to be located. If you mention this article of course you get the standard 10% off everything you buy, including the discount stuff this year. This year is going to be special for Alternating Reality Books as it marks their 5th year of attending and participating with Sakuracon. This is an awesome anime convention and quite possibly the best one on the west coast. Of course nothing compares to Comiket, but if you can’t go to Tokyo, then Seattle is a great place to be. 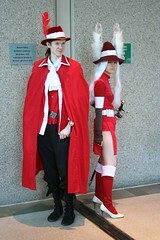 Sakuracon 2011 is from April 22 through 24 at the downtown Seattle convention and expo center. Hope to see you there.